And there was the side-benefit of saying No for an introvert like Shonda: nothing new to fear. I have to admit that as a huge fan of Shonda Rhimes’ shows, I really didn’t know that much about her at all. I liked the concept of this book with Ms. Rhimes telling her story through her year of saying yes to opportunities that she would normally decline. Shonda Rhimes is incredibly talented and successful. She seems honest talking about her life and what makes her uncomfortable. I found her journey in this book especially fascinating. I enjoyed several things about this book, and I’ll highlight a few. 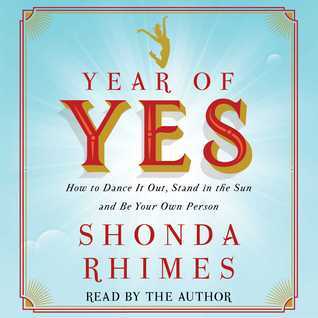 I absolutely loved that the audiobook is narrated by Shonda Rhimes herself! It felt more personal and engaging that way. I loved that her actual speeches from the events that she spoke at were included in the audiobook. Not only were these speeches entertaining, but absolutely inspiring as well. I liked that she was real in her feelings about being a working single mother of three children, about her weight loss, and even how her family interact with each other. I found her sarcasm quite humorous! Finally, I’m so glad to see that she gave much love to one of my favorite fictional characters that she’s created to date in this book. I was so captivated with Ms. Rhimes telling the story of how the character of Cristina Yang was created, what she symbolized to many fans, and the moments leading to filming this character’s final scene on the show. It reminded me of how much I miss seeing Cristina Yang on Grey’s Anatomy. Year of Yes is about the positive things that can happen when making the choice to step out of your comfort zone. This is a motivational read that also made me laugh and smile along the way. I now have a better perspective about the woman behind ShondaLand! The audiobook was a thoroughly enjoyable listen the second time as well. Do you watch any shows created by Shonda Rhimes?